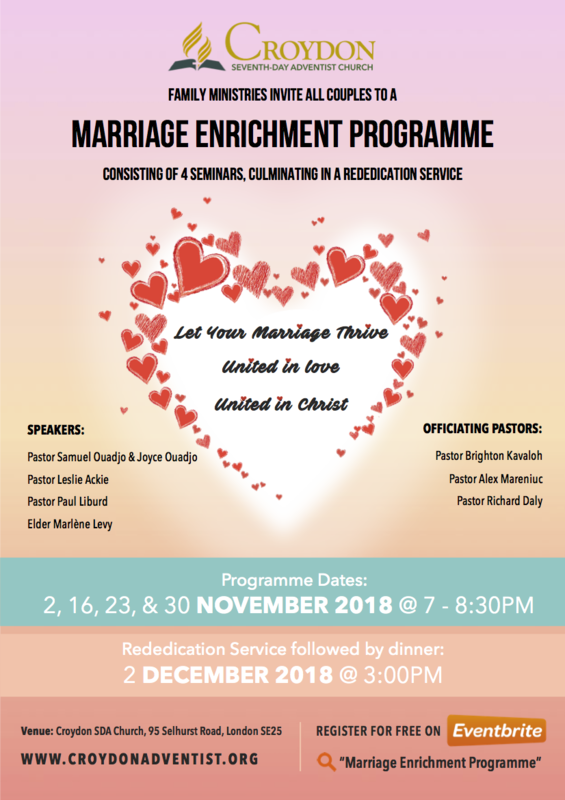 All Couples are invited to a Marriage Enrichment Programme consisting of four seminars culminating in a Rededication Service. Register now for your free place. We look forward to welcoming you! Pastor Sam is married to Joyce whom he met at Newbold College where he studied and completed his Masters in Systematic Theology in 1988. They have two children. Pastor Sam has been the pastor of the Croydon SDA Church since October 2016. He has a passion for church planting and between 2005 and 2019, together with a few men and women, he planted churches in Dunstable, Clacton on Sea, and Essex. Pastor Sam has previously served as the Ivory Coast’s first Conference President until 2005 when he came to the UK to continue the Lord’s work. Pastor Paul Liburd is the NEC Family Ministries Director and his wife Jeanetta is an assistant head teacher in a secondary school. They have been married for just over thirty years and have two children. Over the past years, Pastor Paul and Jeanetta have counselled many couples before and during marriage and as such have witnessed the contrast between the high hopes of pre-marital excitement and the actual reality of marriage with all of its difficulties. It is their desire to help young people make the right life decisions, based on sound biblical principles and wise counsel, as well as assist married couples in finding the happiness that they so earnestly seek. Learn about solution focused problem solving. Explores the dynamic of ‘marital drift’ and the need to be intentional about preserving a healthy marriage. The seminar teaches practical steps to change the trajectory of a pattern of negative interaction in marriage toward more satisfying communication and problem-solving. 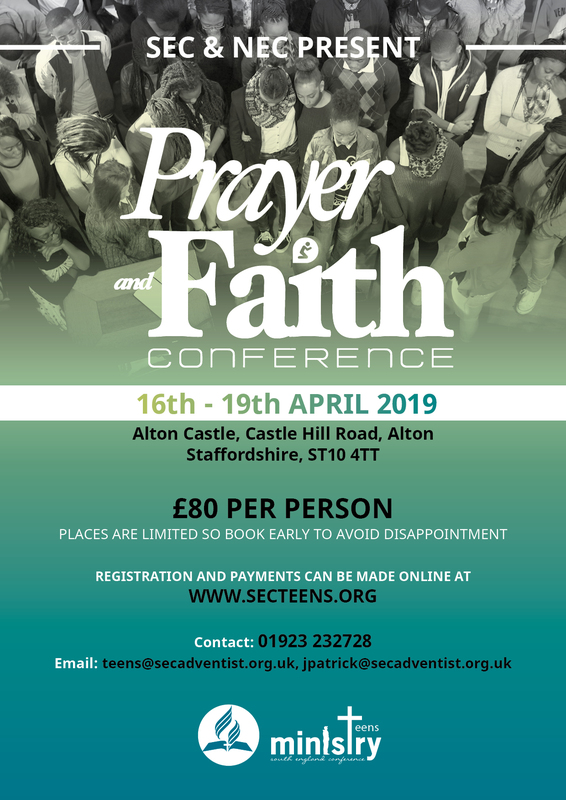 Pastor Les Ackie is the Director for Family & Children’s Ministries at the British Union Conference of Seventh-day Adventists and has worked in pastoral ministry for twenty-two years. He graduated from Newbold College in 1995 and pastored various churches in the South England Conference before serving as Director for Family Ministries in the SEC for seven years. Pastor Ackie has been married to Irma for twenty-three years, and they have two children. Marlène is native of Guadeloupe and moved to the UK in 1991 and is a 4th generation Seventh-day Adventist. She has a varied educational and professional background that includes working as a secondary school teacher, radio producer and host, and recording engineer. In 1999 Marlène started her formal training in counselling, and went on to do a diploma at Goldsmiths College, University of London, followed by an MSc at Sheffield University. She has worked in the NHS and the voluntary sector as a mental health specialist and therapist, and currently runs a private practice. As an ordained first elder at Croydon SDA church, she is passionate about communicating the redeeming love of Jesus-Christ and His infinite healing power to restore individuals. With her husband Dr Christopher Levy, they are devoted to helping others through their ministry. They have one daughter.